Urban planners long have been concerned about “urban sprawl,” despite never having settled on a term that excludes any urbanization, even the densest in the world. But the European Commission (EC) has taken exaggerating about urban sprawl to a new level. This is best illustrated by the treatment of Beijing in its Atlas of the Human Planet – 2016. The EC estimates that the Beijing urban area now covers more than 50,000 square kilometers, which is more than 10 times previous continuous urbanization estimates (see: Demographia World Urban Areas). Their approach tends to make cities seem bigger than they are in reality. The EC’s overall 84% world urbanization estimate is well above the United Nations’ 55%. The photograph above shows the urban sprawl of the EC’s Beijing urban area (Note). It was taken just south of Beijing, in the municipality of Baoding, Hebei province. EC researchers broadened the definition of “urban” by adopting a population density threshold so low that much of eastern China’s agricultural land could be designated as “urban.” The questionable urban definition includes adjacent square kilometer grid cells with more than 300 persons per square kilometer that combined have more than 5,000 residents. At Chinese densities, it is not difficult to agglomerate adjacent grid cells to reach 5,000 residents. This has allowed the EC to declare Beijing to be the world’s first gigacity, with more than 100 million residents --- a figure that is five times the population within the actual built-up area. My view is that, with respect, the EC has made a serious mistake, here and elsewhere. For example, according to the EC, the Cairo urban area covers more than 20,000 square kilometers, with a population of more than 40 million. In fact, the Cairo urban area covers less than one-sixth the EU figure, while the population is exaggerated by at least 20 million. Cairo is surrounded on three sides by largely uninhabited desert and extensive agriculture. Some of the world’s leading urban researchers have expressed similar concerns. New York University Professor Shlomo Angel and his colleagues Patrick Lamson-Hall, Bibiana Guerra, Yang Liu, Nicolás Galarza, and Alejandro M. Blei minced no words in protesting the conclusions of the European Commission research, charging “that the European Commission’s number is implausible if the word ‘urban’ is to retain any familiar meaning at all.” Angel and some of the others above are also authors of the ground-breaking Atlas of Urban Expansion, published by the NYU Urban Expansion Program at New York University, UN-Habitat, and the Lincoln Institute of Land Policy. Part of the problem lies here: High population densities in agricultural areas are common in some parts of China and Indonesia, where small, dense villages are completely surrounded and separated from one another by farmland. 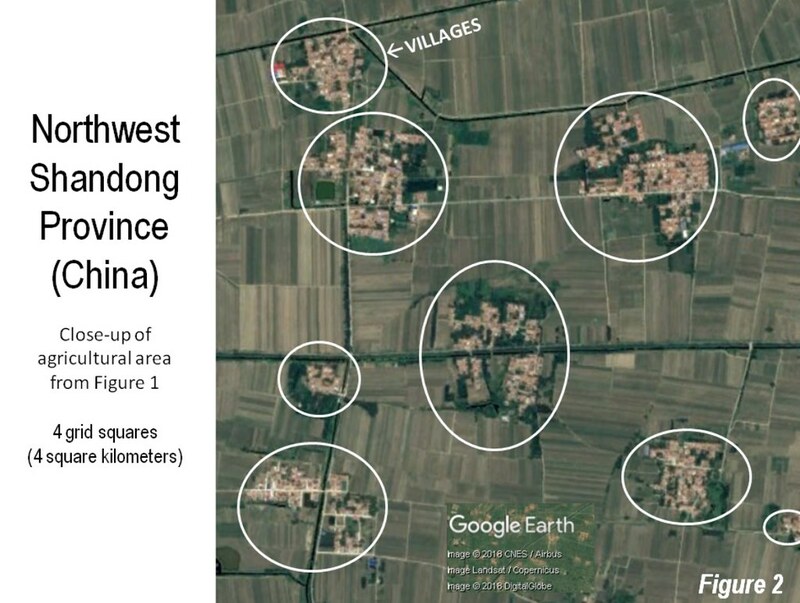 An urban planning colleague sent along an email attachment illustrating the point that some rural land in China (between Luoyang and Zhengzhou, in Henan) has as high a population density as the Los Angeles built-up urban area. Los Angeles is the densest built-up large urban area in the United States. Density thresholds do not, in and of themselves define urbanization. This requires contiguity of urbanization between and within the grid cells. In China’s leading agricultural producing province, Shandong, more than 90% of the rural counties (Note 2) exceeded 300 per square kilometer in the 2010 census. In the second leading agricultural province, Henan, more than 80% of the rural counties had densities of 300 or more per square kilometer. Further, these high rural densities are not new. In Baoding, site of the photograph above, thirteen of the 14 rural counties with densities at least 300 per square kilometer had reached that level by the 1982 census. It is significant that this was at the beginning of the reform era, before China’s massive urbanization, now nearly 60%, but only little more than 20% in 1982. Two Google Earth illustrations demonstrate the problem with the EC urban definition. 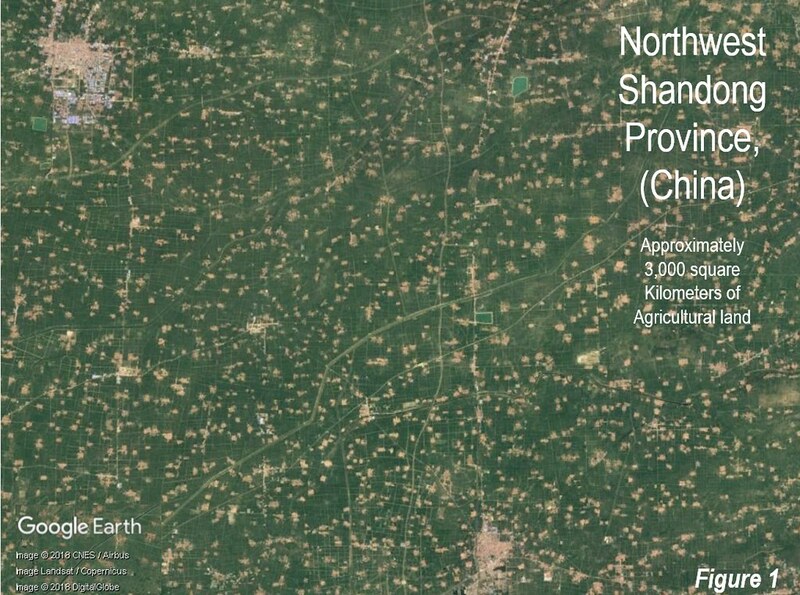 Figure 1 shows approximately 3,000 square kilometer part of northwestern Shandong, with numerous tan dots that are villages in the midst of the green background of agriculture. Each of the villages is surrounded by farmland. They do not represent contiguous urbanization because they are adjacent to agriculture, not urbanization. Figure 2 shows a four square kilometer area at a larger scale from Figure 1. Each of the villages is circled to illustrate its surrounding farmland. This illustration shows how a rural area can have a high density, without being counted as part of contiguous urbanization. Angel, et al. “recommend that the 84% number proposed by the European Commission not be bandied about but be laid to rest, and we urge its competent researchers to go back to the drawing board and start afresh.” This is good advice from researchers who let the facts, and daily reality, not ideological aspirations, drive their conclusions. Note 1: It is presumed that this is included in the EC’s Beijing urban area. Unfortunately, the Atlas of the Human Planet contains no map of sufficient resolution to guarantee it. However, any 50,000 square kilometer Beijing urban area would have an abundance of land as obviously rural as this. Note 2: In Shandong, 56 of the rural 60 counties (“xian”) outside urban areas or county level cities had population densities above 300 per square kilometer. In Henan, 72 of the 88 rural counties had population densities above 300 per square kilometer. Photograph: “Urban Sprawl” in the Beijing Area, according to EC criteria (by author). Submitted by qet on Wed, 08/15/2018 - 12:04. At the end, Cox praises the "world's leading researchers" for being led by "facts. . . not ideological aspirations." Yet earlier, he says "Density thresholds do not, in and of themselves define urbanization. This requires contiguity of urbanization between and within the grid cells," and quotes said researchers as "charging “that the European Commission’s number is implausible if the word ‘urban’ is to retain any familiar meaning at all." The definition of "urbanization" is in no way a fact, nor is its meaning. A definition is an invention, a work of the imagination. Reasoning from definitions is tautological. Definitions are the very work of ideologies. Certain elements of the Western electorate take definitions pronounced by approved authority as facts and then charge all who do not accept the definition and the necessary tautological conclusions to which it must lead as living in a "post-fact" or "post-truth" world. A specific density measurement of a region is a fact. * Whether it indicates "urbanization" is a matter of definition. Argue that your definition is out of line with "familiar meaning" and you will be called a reactionary. In 1984, an increase in the chocolate ration would leave you with a smaller mass of chocolate than you had before; was it not therefore an increase? (* yes and no. Change the definition of "square kilometer" and the density is automatically changed). It is the powerful who make the names of things into law, said Nietzsche. Seizing control of the definitions is a seizure of power. Definitions are taken as facts by large elements of the Western electorate. Change the definition and you change the fact. See, e.g., gender. But the word fact compels obedience where the word definition does not. Here, in a nutshell, is our politics.